Magnesium, the fourth most abundant mineral in our body, may not have the nutrient star power like vitamin D, but its humble nature should not be overlooked. Decades of research have demonstrated the power this major mineral plays in keeping us healthy, and the active and mandatory role it has in over 300 biochemical reactions. In addition, magnesium may hold a valuable key to lessen the risk of one of the most common and fastest growing diseases in the United States – type 2 diabetes. Participating in the activity of more than 300 enzymes. Necessary for the release and use of energy from carbohydrates, fat and protein. Involved in the metabolism of potassium, calcium and vitamin D.
Vital for proper heart functioning. A team player along with calcium in the movement of muscles – calcium helps with contraction while magnesium helps muscles to relax. Promotes resistance to tooth decay by holding calcium in tooth enamel. “Magnesium has many other health benefits including reducing stress, improving quality of sleep and supporting a healthy immune system,” said Dr. Samadi. In recent years there have been several studies that have linked magnesium to possibly helping to reduce type 2 diabetes. One was a 2013 Tufts University study involving more than 2,500 people, demonstrating that healthy people with the highest intake of magnesium were 37 percent less likely to develop high blood sugar or glucose which leads to diabetes. People with pre-diabetes were 32 percent less likely to develop diabetes if they consumed adequate magnesium. When comparing the overall risk of developing diabetes, people with a high magnesium intake were 53 percent less likely to develop diabetes than people with a lower intake. For seven years, the study followed 2,582 participants, aged 26 to 81 at baseline, who are enrolled in the Framingham Heart Study Offspring study. The second study, published in the journal Diabetes Care, was a meta-analysis of 13 prospective cohort studies that looked at over 500,000 participants, and showed that increased consumption of magnesium-rich foods may bring considerable benefits in diabetes prevention. This study verifies previous studies that provided a relationship between increased intake of magnesium-rich foods and a reduced risk of diabetes. The studies did emphasize that eating foods rich in magnesium generally is associated with people who most likely are already consuming healthy foods and following an overall healthy lifestyle. Foods that are high in magnesium tend to also be rich in dietary fiber and phytochemicals that have also been shown to be protective against diabetes. The way magnesium may help minimize risk of type 2 diabetes involves its connection and relationship with insulin. Magnesium and insulin work together to control blood glucose levels. Insulin is a hormone secreted by the pancreas that is necessary for our cells to be able to take glucose out of the bloodstream. In doing so, our blood glucose doesn’t become too high, which can do a lot of internal damage to our bodies. Without sufficient magnesium, insulin isn’t able to function properly. When insulin can’t do its job, our cells become resistant to taking in glucose, allowing blood glucose levels to rise, leading to diabetes. For women 19 and older – 310 to 320 milligrams. 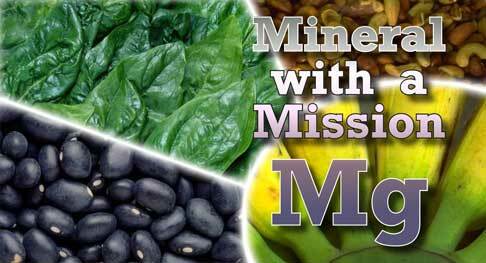 Processed and refined foods are low in magnesium content. For example, when grains are processed, such as white bread, up to 80 percent of magnesium is lost and enrichment doesn’t replace it. If your diet is composed of lots of processed and refined foods and few vegetables, legumes and nuts, you may not be consuming adequate sources of magnesium. If your tap water is “hard” water, this can also be a significant source of magnesium, as hard water contains relatively high amounts of both magnesium and calcium. What about taking a magnesium supplement? Should a person simply take a magnesium supplement to get in the required daily amount your body needs? “Your doctor may recommend that magnesium supplements are appropriate, but be sure to consult with your physician before taking anything,” advised Dr. Samadi. The UL (tolerable upper intake level) for magnesium, established by the Dietary Reference Intakes, recommends that healthy people should take no more than 350 milligrams of magnesium per day as a supplement. Also anyone taking a calcium supplement should be consuming food sources rich in magnesium as a high calcium intake can interfere with magnesium absorption. Magnesium’s role in possibly reducing the risk of type 2 diabetes should be highlighted and investigated further. If increasing dietary intake of magnesium could be a piece of the puzzle to shrinking the number of people diagnosed with type 2 diabetes, what a simple, easy way of making this happen. For anyone who is at an increased risk of developing type 2 diabetes, whether due to family history, ethnicity, being overweight or other factors, expanding their dietary intake of magnesium, along with other healthy eating habits and physical exercise, could prove to be very beneficial in avoiding this disease. Let magnesium’s magic work for you. Sources: Insel, P., Ross, D., McMahon, K., Bernstein, M. (2014) Nutrition. Burlington, MA: Jones & Bartlett Learning; Sizer, F., Whitney, E. (2011) Nutrition Concepts & Controversies. Belmont, CA: Wadsworth Cengage Learning; Dong, J.Y., Xun, P., He, K., Qin, L.Q. (2011). Magnesium intake and risk of type 2 diabetes. Diabetes Care, volume 34; Office of Dietary Supplements. Dietary supplement fact sheet: Magnesium. Available at http://ods.od.nih.gov/factsheets/magnesium. Accessed June 2015; Hruby, A., Meigs, J.B., O”Donnell, C. J., Jacques, P.F., McKeown, N. M. (2013) Higher magnesium intake reduces risk of impaired glucose and insulin metabolism and progression from prediabetes to diabetes in middle-aged Americans. Diabetes Care; American Diabetes Association.